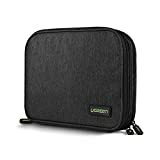 Keep your electronics accessories organized and easy to find with this Universal Electronics Accessories Travel Organizer from Ecosusi. This original, lightweight nylon organization system contains so many loops, pockets, and pouches you can use it for your electronic devices, accessories and cords; your cosmetics and toiletries; small tools; school or office supplies; specialized work equipment. 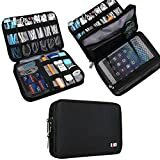 This Universal Electronics Accessories Travel Organizer provides a flexible organization solution for your electronics and computer accessories. It helps make you better organized with all the small electronics items and gadgets. 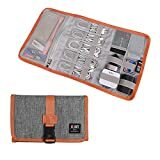 Measuring 6.5 x 9 x 0.8 inches it is large enough to hold most of your accessories likes hard drive, cables, adapters, chargers, memory cards, batteries, pen and styli, or almost anything else you might need with you. This organizer features 12 elastic loops of three different sizes, 1 internal zip mesh pocket and 2 small mesh bag pockets for important documents like passports, air tickets, boarding pass and etc. It provides excellent flexibility to allow you maximizing its storage space. Made of heavy-duty, durable and waterproof nylon. External Dimension: 9.44" x 5.83" x 1.18"; Weight: 0.31 lb. 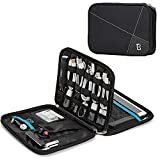 This Portable Universal Electronics Accessories Travel Organizer / Hard Drive Bag / Cable Organizer is Made of heavy-duty, durable and waterproof nylon. Most versatile organization system designed to hold items firmly in place, Endless configurations. Perfect companion for your laptop bag or travel case. Special zipper spaces for CF cards, U disk, bank cards, passports etc. BGTREDN Double Layer Electronics Organizer Bag - Born for large capacity. Whether you know someone traveling around the world or their commute to work feels like it, you can make their life much easier with BGTREND awesome electronic organizer bag. It is a great piece, given as a gift to your family, colleagues and friends. Size: 10" x 7.5" x 1.5"
Made with cation, four-stage anti-splash treatment on the surface，wear-resistant and easy to clean，providing protection for the contents of the bag all-weather . Material：made of waterproof cationic polyester. Whether you are on the go or storing your electronics accessories at home, This organiser from Damero is a must-have. Keep All in One Place - This electronics cable bag will help you to keep all of your electronics accessories and various cables together. No more messy! It will give you a lot of help whether in your trip or in your home. 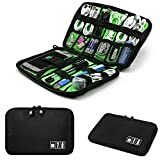 Well Protected - This electronics travel organizer bag is made of double layers waterproof fabric and shockproof material. This travel cord organizer bag is very strong and durable. All the things inside are protected very well. This electronics cable bag will help you to keep all of your electronics accessories and various cables together. No more messy! 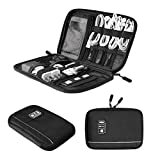 This travel electronics organizer bag has many storage spaces. It will keep your items separated and easy to be found. This travel cord organizer bag is very strong and durable. All the things inside are protected very well. A special big pocket is designed to fit your tablet. Your tablet will be protected very well in this travel cable organizer bag. KEEP ALL IN ONE PLACE: Double layer Nylon interior compartment, enough roomy to hold various items like cables, flash disk, USB drive, Power, Headphone and etc. Dimensions: L9.8"* W7"* H1"
PREMIUM QUALITY: Medium, double layer, made of heavy-duty, durable and waterproof nylon material(No accessories Included). Zippers closure ensure your item secure. MULTIPURPOSE: Also can be as Cosmetic Carrying Bag. Most versatile organization system designed to hold items firmly in place, Endless configurations Perfect companion for your laptop bag or travel case. Are you troubled about jumbled cables? Do you root around(or often tip out all your items) in the search for the right cable? BUBM Bags are perfect to store your electronics accessories without searching all over the place. Cable Organizer--12 elastic loops keep your cables tidy and you know where they all are. Cards Holder--6 easy access mesh pockets to sort your memory cards, CF Cards, USB sticks, dongles and more. Mesh Zipper Compartments--3 mesh compartments to store external hard drive, power bank. GRID-IT! Your Gadgets’ Best Friend! The Most Versatile Organization System Available. The Ultimate Organizer! The GRID-IT! system provides endless configurations for your digital devices and personal effects. Convenient sizes make it a great companion for your current laptop bag or travel case. 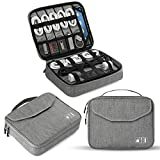 1.Keep all in one place: The electronics organizing bag has enough roomy to hold various items like cables, flash disk, Cords, Memory Cards,USB drive, Power, Charger, passport,Adapters ,Pens, Headphone ,airpods and etc. 3.Premium quality: The electronic gadgets in medium size which is made of heavy-duty, durable and waterproof nylon material offer excellent protection for your accessories. It can protect your digital accessories from damage. 5, Multipurpose: The bag cord organizer was designed to hold items firmly in place,2 year warranty. 2. 2 zipper Design - 2 zipper opening for easy and immediate access to your all your electronics accessories. 4. Perfect for Traveling -this bag can serve as a travel checklist, don't have to worry about forgetting important things any more, the must bag to keep things organized on the go; best organizer to save your packing space in your shoulder bag, suitcase. 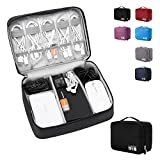 5,High Capacity -The travel bag for electronics cords will protect your small electronics (GPS units, mobile phones, digital cameras) plus cables, extra batteries and other accessories. 1x bigger mesh pouch for power bank ,mobile phones, GPS units ,Passport, Mini Camera,earphones or other small PC accessories.